COOKSMART is a fun, hands-on cooking program for kids. We offer After-School programs, PD Day camps, March break Camps, Summer Camps and In-school programs. By providing the foundation of healthy eating options and fundamental cooking techniques, kids learn from an early age how to safely prepare meals. ​We make healthy eating fun while teaching kids an important life skill. We follow the Canada Food Guide and our recipes are developed by nutritionists. Programs are offered throughout Toronto and Mississauga. Our programs are allergy friendly since recipes are tailored to the students in the class. "My kids loved the Cooksmart program"
My kids loved the Cooksmart program. N. has been asking to eat sushi which is a big step in our house, and both N. and E. are busy making their own smoothies. They have all been more helpful in the kitchen and I. mentioned last night at dinner that you have to taste things with all your tastebuds so it has to be a big enough bite. With all the different food choices available, it can be a little daunting to get started in the kitchen. Yet cooking is a lifelong skill that will serve students well in the future, not to mention it’s a delicious hobby! Chisholm Middle School students learned through hands-on experience how to properly prepare a nutritious and colourful meal through the Cook Smart program. Students began their morning workshop with a discussion about proper nutrition and foods which provide health nutrients. Then students learned how to properly wash, cut and prepare foods by following a recipe. The gym was alive with sounds of slicing, dicing, grating and creating a layered bean salad. The students’ patience and teamwork skills paid off as they were able to enjoy their creation at the end of the workshop. Staff and students all agreed that the food was delicious. Students also learned how to properly wash the utensils they used to make their food and how to clean up after themselves in the kitchen. Overall, the students and staff enjoyed the opportunity to discover their culinary creativity. COOKSMART started in the kitchen of Kathy Stewart, with her three small children learning how to cut veggies for their pizza toppings. The kids were excited to practice their new skills, especially when they could snack at the same time. As their confidence grew using a knife, they became curious for greater challenges and were soon cooking and baking inspired creations for the whole family. Seeing the independence that only a few simple cooking skills gave her own children, Kathy created a vision for COOKSMART. 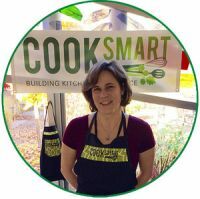 Kathy's extensive experience as a teaching professional, coupled with her training as a nutritionist has given her the knowledge, skills, and passion to make COOKSMART a reality. Our goal is to inspire better food choices and basic cooking for life-long healthy eating! With all the different food choices available, it can be a little daunting to get started in the kitchen. Yet cooking is a lifelong skill that will serve students well in the future, not to mention it’s a delicious hobby! 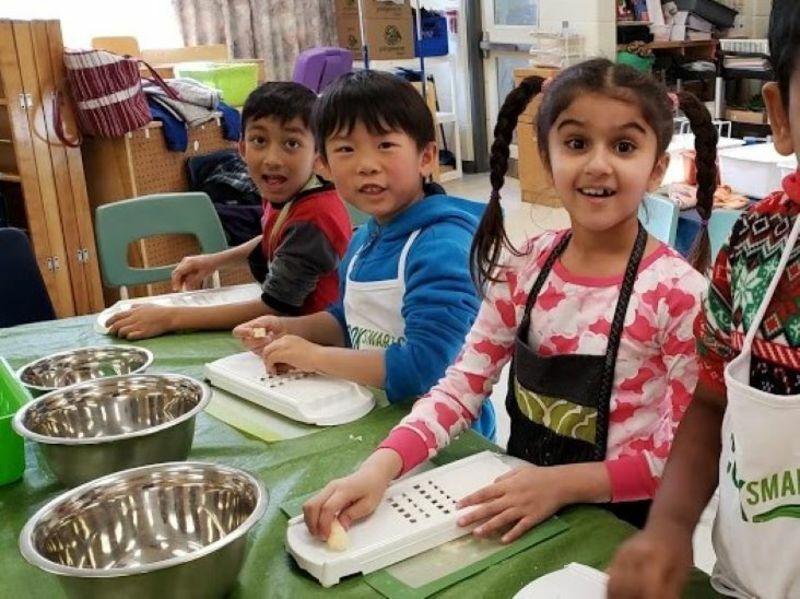 Chisholm Middle School students learned through hands-on experience how to properly prepare a nutritious and colourful meal through the Cook Smart program. Students began their morning workshop with a discussion about proper nutrition and foods which provide health nutrients. Then students learned how to properly wash, cut and prepare foods by following a recipe. The gym was alive with sounds of slicing, dicing, grating and creating a layered bean salad. The students’ patience and teamwork skills paid off as they were able to enjoy their creation at the end of the workshop. Staff and students all agreed that the food was delicious. Students also learned how to properly wash the utensils they used to make their food and how to clean up after themselves in the kitchen. Overall, the students and staff enjoyed the opportunity to discover their culinary creativity.